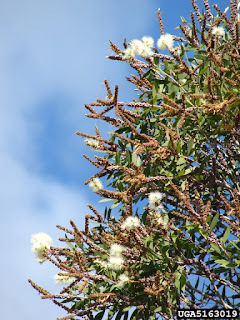 Melaleuca, Melaleuca quinquenervia, is most easily recognized by the combination of whitish peeling bark, white bottle brush shaped inflorescence and narrow 5 veined leaves. 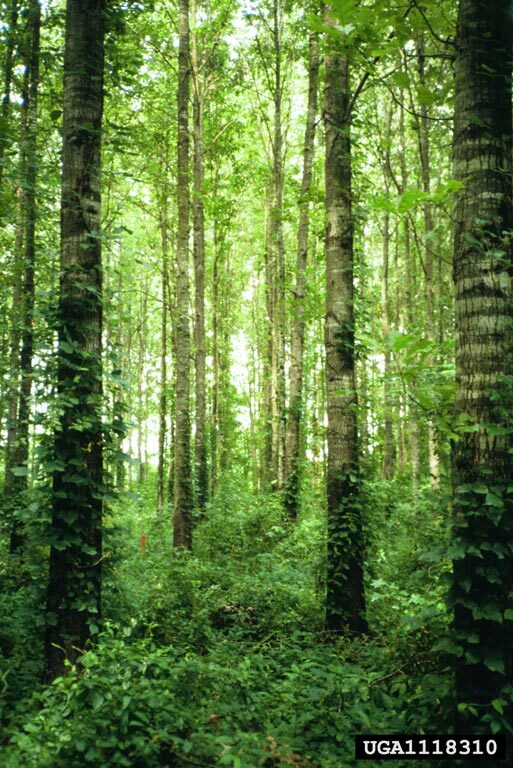 It is an evergreen tree that reaches heights of between 50-90 feet tall. Generally growing in an erect form with a single trunk and narrow crown that is often open and irregularly branched. 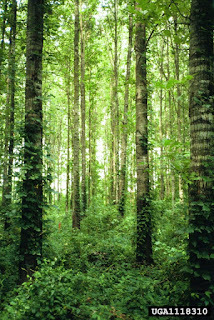 It is well established in hammocks, pine lands, disturbed woodlands and along roadsides mostly in Southern Florida and sparsely in Southeastern Louisiana. This variety originated in Australia and Melanesia. 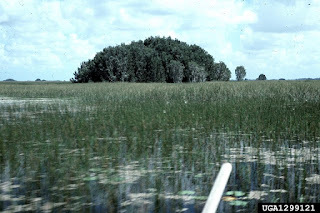 Melaleuca quinquenervia is considered to be one of Florida's top three invasive species. It covers thousands of hectares in tropical and subtropical regions. Eradication efforts have been largely unsuccessful due to it's aggressive growth and rapid establishment. It has even reestablished itself after forest fires that have wiped out all other growth. 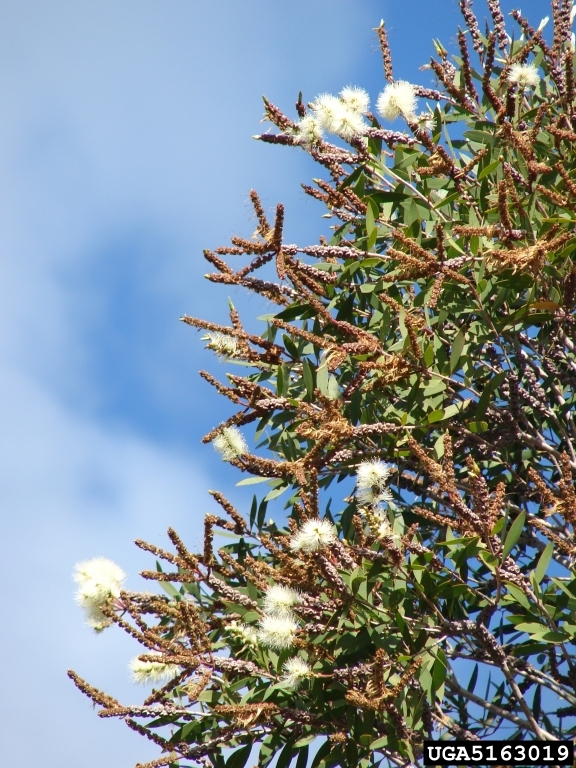 The leaves of the Melaleuca are alternate, simply shaped, slightly thickened and stiff. When crushed the leaves have a resinous odor when crushed, narrowly elliptic, or oblanceolate with a evenly tapered base and tip. The flower is bisexual with 5 tiny sepals and petals, white in color and circular shaped 2-3 mm broad, filaments are white. They are produced closely together, sometimes interuppted, internodal clusters 5-15 cm long, giving the appearance of a bottle brush. The fruit which occurs almost year round is a roundish or square capsule that is stalkless and crowded encircling the stem between leaf nodes, seeds are brown. 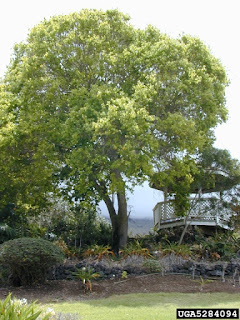 Camphortree - Cinnamomum camphora, is a small to mid sized evergreen that can reach heights of up to 60 feet tall. 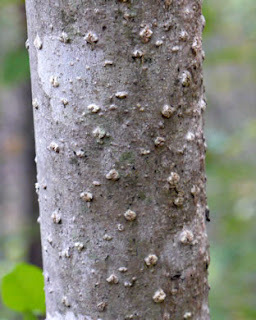 It grows in an erect form generally with a single short trunk, sometimes producing several secondary trunks from the base. The tree generally has a dense crown that grows in an oval form, with lustrous often low spreading branches that become more or less ascending with time. Native to Asia, it is now naturalized on disturbed sites, vacant lots, roadsides, upland woodlands, and fence lines from Southeastern North Carolina, South through Georgia and Florida and West through Eastern Texas. 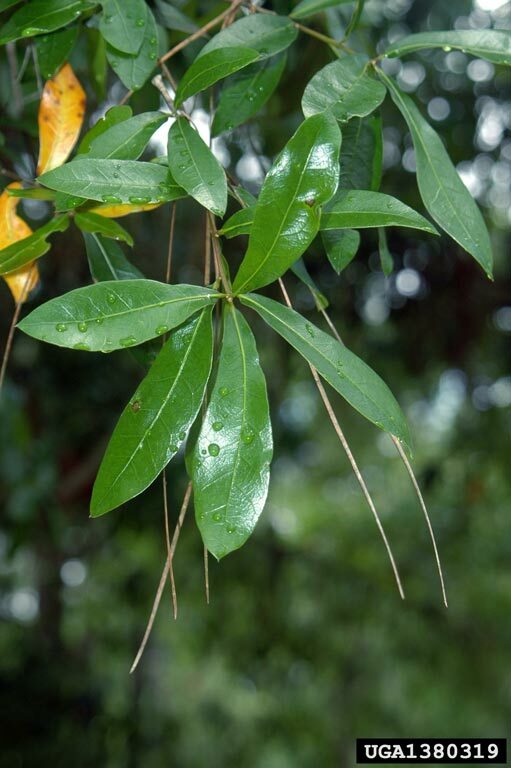 There are over 200 species of Cinnamomum recorded, most of which are native to India, China and Japan. 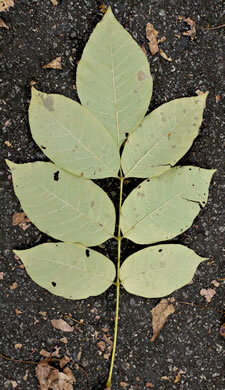 The leaves of the Camphortree are alternate, simple in shape, and somewhat leathery at maturity. The leaves and bark give off a camphor like aroma when crushed. The bark is dark cinnamon brown to dark steel in color and becomes deeply furrowed with age. The flowers are bisexual and tiny in size 1-2 mm in diameter, with 6 green-white or creamy tepals occurring in the Spring annually. The fruit is a lustrous black drupe 8-9 mm in diameter and born in a cup like receptacle, maturing in Autumn to Winter annually. 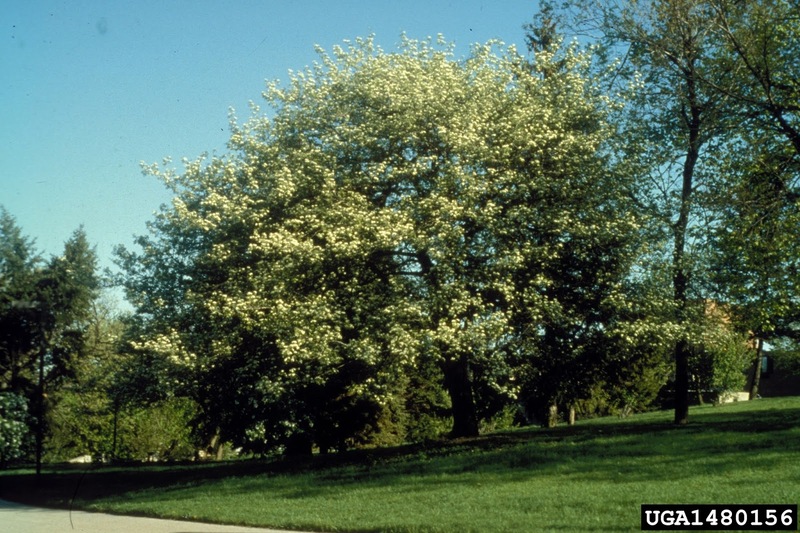 The Downy Hawthorn - Crataegus mollis - is a relatively small tree or large shrub that reaches 25-35 feet at maturity. It generally grows in a single trunk but can also grow in a multi trunk or shrub form. Because of the dense branching structure and thorns, Downy Hawthorn and other hawthorns provide great nesting habitat for the Yellow-Breasted Chat, Brown Thrasher, and other small birds. They also provide excellent protective covering for birds and other wildlife during the summer. The pollen & nectar attracts various bees, flies and beetles. 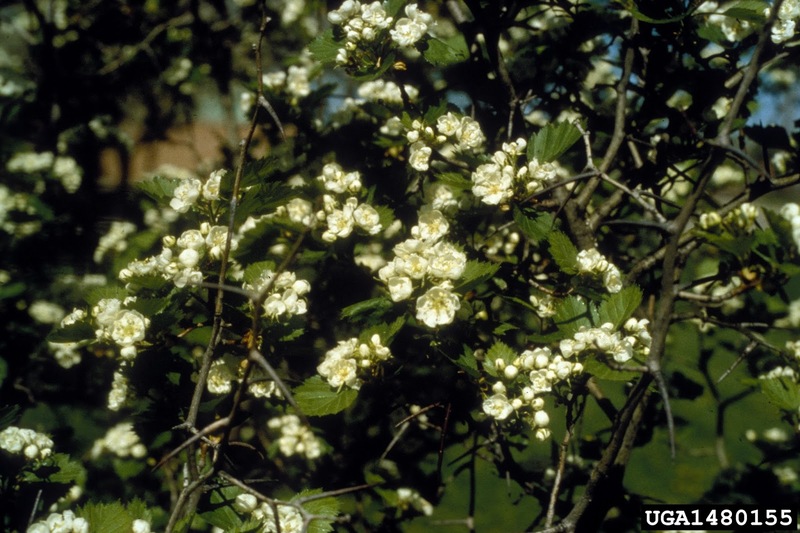 Other insects such as caterpillars and moths feed on the foliage, flowers and wood of the Downy Hawthorn. 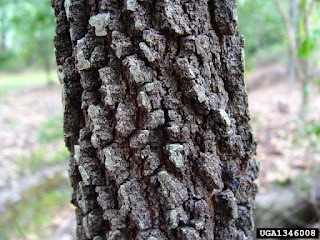 The trunk bark is roughly textured, shallowly furrowed and a grey-brown in color. The branch bark is smoother, and slightly lighter in color. 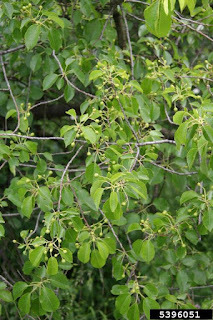 Young branches are non-woody and green. The root system is woody and branching in habit, and it spreads by reseeding itself. The leaves are simple, oval in shape and shallowly clefted with 3-5 lobes along the edges. The leaves are generally bluntly pointed rather then rounded. The margins are serrated or double serrated and the leaf bases are slightly cordate to truncate. 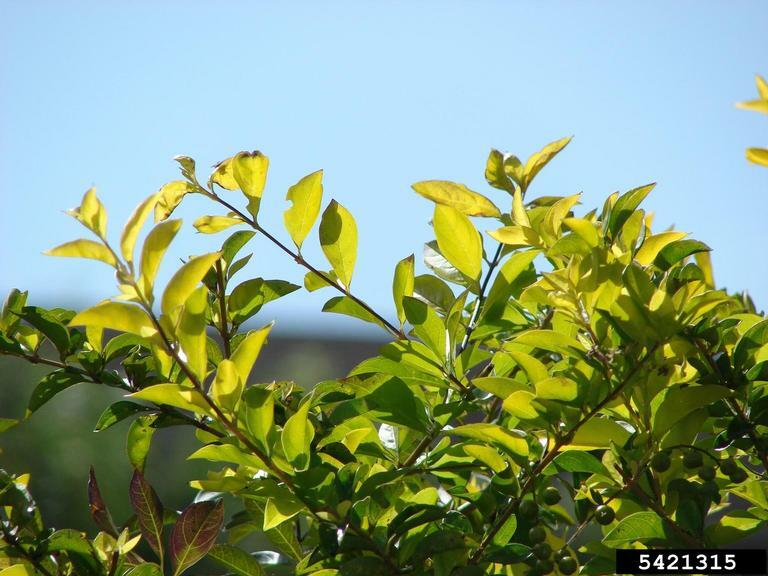 Upper leaf surfaces are medium to yellow green in color while the lowers are pale green and pubescent. 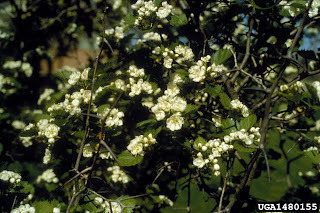 White flowers are produced on short spur twigs, they are 1-3 inches across and generally flat headed. 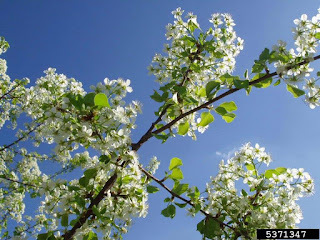 The blooming period is short lasting only about two weeks during the late Spring. The flowers have a foul often pungent odor. Fertile flowers are replaced by small apple-like fruits that become ¾-1" across at maturity during late summer. Young fruits are light green and pubescent, while mature fruit are yellowish red to scarlet and hairless. The fruits each have 4-5 chunky seeds. The Portia - Thespesia populnea, is an evergreen shrub or small bushy tree that reaches heights of 10-30 feet tall. 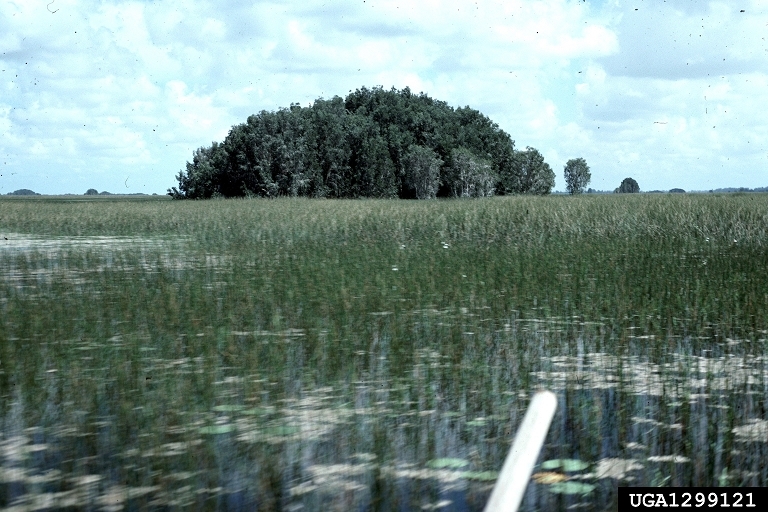 Growing in in an erect form with either a single or multiple trunks and low branching habit. 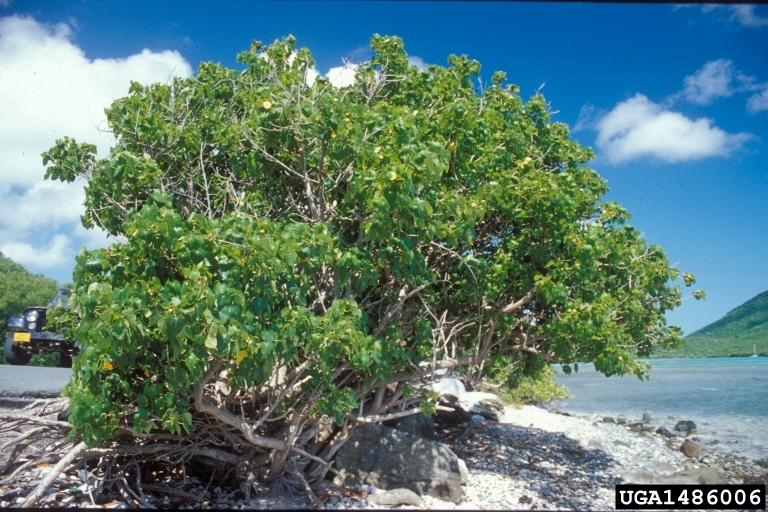 It was introduced to the United States, but is native to Old and New world tropic locations, it has escaped cultivation and established itself on disturbed sites, coastal hammocks and beaches in South Florida. In South Florida this species is considered to be invasive as it has a very weedy tendancy. 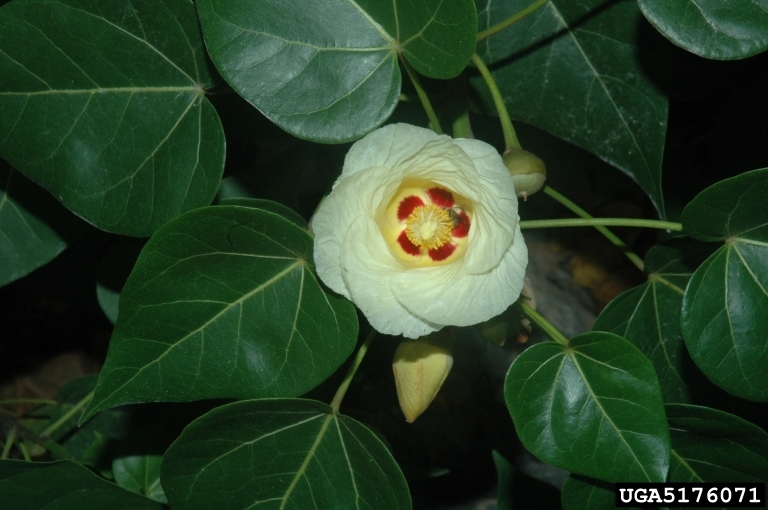 Thespesia is a genus of about 17 species that are distributed only in the tropical parts of Africa, the Americas, Asia, and Australia. The leaves of the Portia are alternate, simple, ovate, with a heart shaped base and long pointed tip. The flowers are Corrolla yellow with a red or maroon base inside of the bloom. Flowers are bell shaped about 8 cm in diameter with a staminal column about 2.5 cm long, occuring year round. The fruit that also occurs year round, is flattened or rounded in the form of a leathery capsule. When young the fruit is yellow, becoming black when mature, the seeds are brown and hairy. 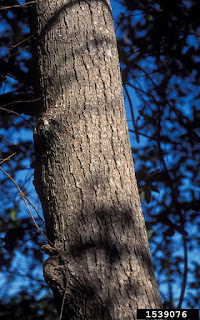 The bark is smooth brown with gray mollting. 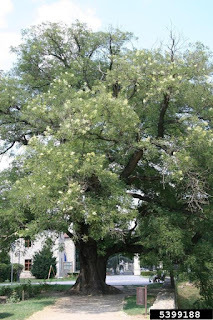 Japanese Pagoda Tree - Styphnolobium japonicum, is recognized by the combination of pinnate leaves, white or yellow to white flowers and yellow to brown, necklace like legume. It is a deciduous tree that reaches heights of about 60-65 feet tall. 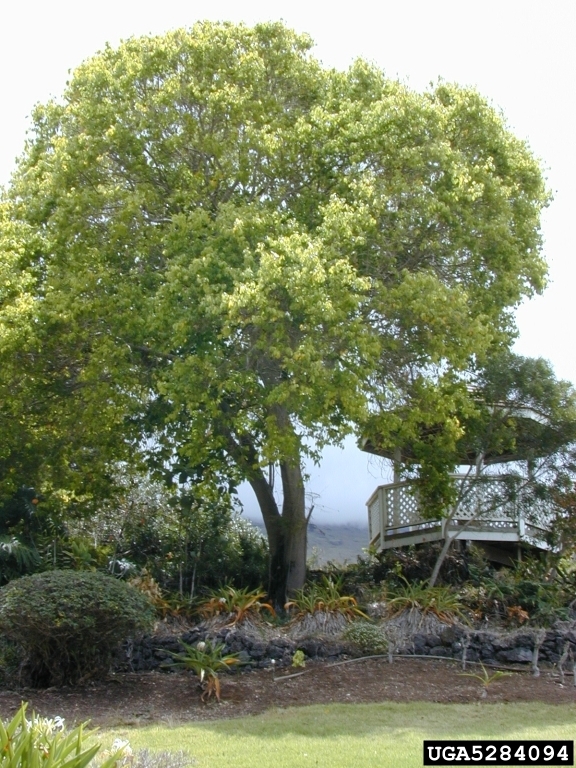 Growing in an erect form with a single trunk and broad crown. It was introduced from Asia and is cultivated and now naturalized from Pennsylvania and Ohio in the North to North Carolina in the South. The Styphnolobium or Necklacepods is a small genus, made up of only 7 species of shrubs and trees. The leaves are always alternate and pinnately compound and the flowers bisexual. The fruit is a very distinct beadlike legume and the seeds are toxic. The species in this genus have been commonly grouped with the Sophora, unlike the Sophora species, they lack the ability the fix atmospheric nitrogen. 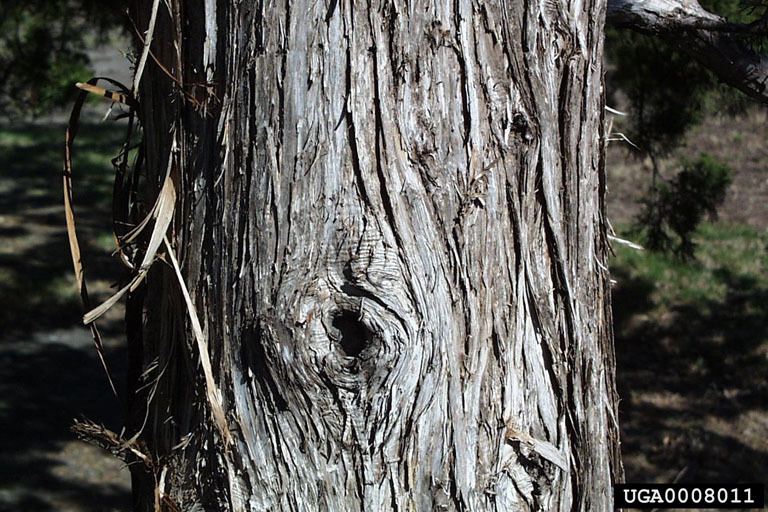 The bark of the Japanese Pagoda Tree is gray-brown and ridged with elongated vertical furrows. The leaves are alternate and pinnate, the blades are 15-25 cm long and about 11 cm broad. The leaflets are 7-17 in number alternate and opposite. The flowers are bisexual and either Corrolla White or Yellow White in color and about 1 cm long each. 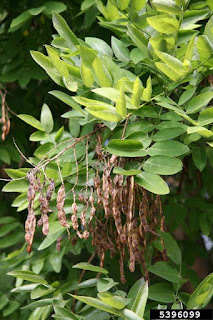 The fruit is hairless and yellow-green to light brown in color and in the form of 8-20 cm long legumes with seed compartments that mature in Autumn and persist into Winter. 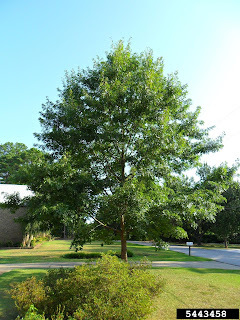 Cherrybark Oak - Quercus pagoda, is most easily recognized by the combination of leaves with 5-11 marginal lobes and hairy lower surface, large buds and bark that is very similar to that of a Black Cherry. 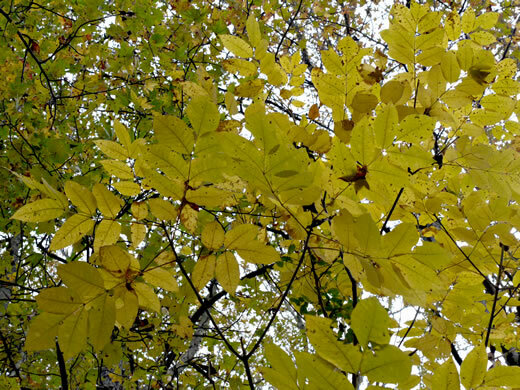 It is a deciduous tree, potentially reaches heights of 60-80 feet tall. Growing in an erect upright fashion with a single trunk which is generally clear of branches on the trunk. 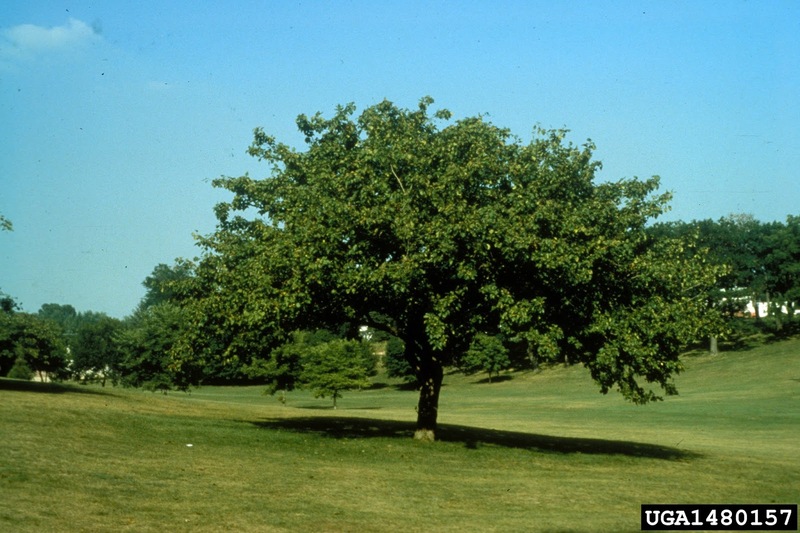 The Cherrybark Oak prefers a bottomland, floodplain forest, lower slopes, river beds and other areas that are subject to periodic flooding. 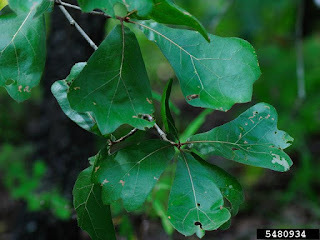 The Overcup Oak is another Oak that is commonly found growing in the same habitat areas, however they are not very similar in appearance having very different leaves and acorns. The leaves of Cherrybark Oak are alternate, simple, ovate or elliptic to nearly obvate. The upper leaf surface is lustrous and dark green in color hairy when immature. The lower leaf surface is paler and densely hairy and soft to the touch. The fruit is in the form of an acorn with a cup that is 3-7 mm deep, brown in color, rounded and striped. This is one of the largest and fastest growing of all the Southern Oaks. 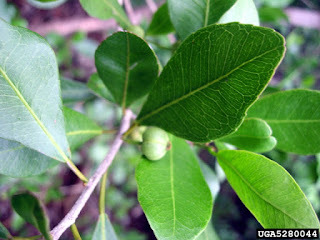 Oysterwood - Gymnanthes lucida (also called the Crabwood), is the only tree native to Florida whos leaves have an eared base. It grows in an erect form with a single trunk and narrow crown. It is found in Hammocks in the Florida Keys and Southern Florida only. A member of the very small genus Gymnanthes which is made up of only 12 species a distributed in the American tropics, Oysterwood is the only member found in North America. 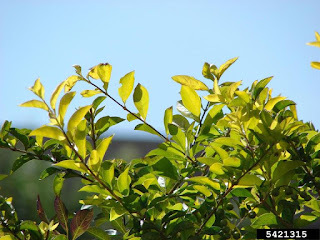 It is an evergreen shrub or small tree that reaches height of only about 30 feet tall. The bark of the Oysterwood is smooth, sometimes finely fissured, and gray-brown in color. The leaves are alternate, simple, leathery, elliptic with a distinct ear shape at the base. The flowers are unisexual, with male and female on the same tree. Flowers are mostly absent of petals and sepals. Male flowers occur in elongated racemes reaches up to 5 cm long, but remaining shorter then the leaves. Female flowers are solitary at the tip of a long stalk that arises from the base of the male raceme. Flowers occur between Summer and Winter annually. The fruit is rounded, 3 part with a dark brown capsule that reaches up to 12mm in diameter. 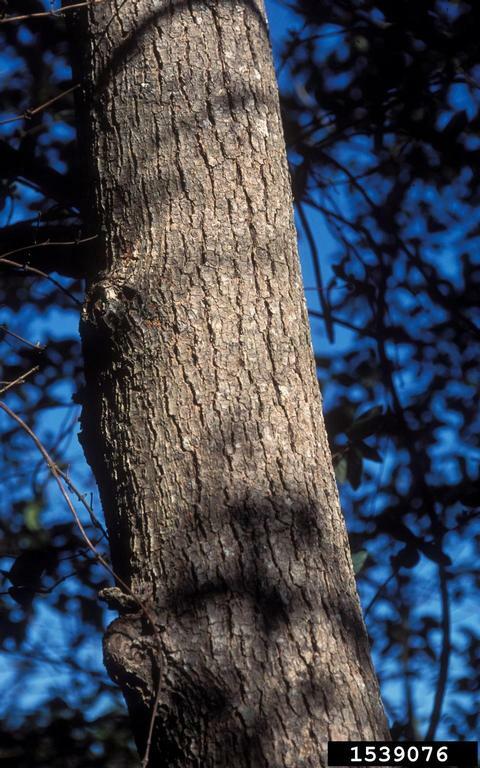 The Southern Red Oak is a deciduous tree that reaches heights of around 100 feet but sometimes much larger. It grows in an erect, single trunk with initially a narrow crown that spreads with age. It is most easily recognized by it's U shaped based and extended sickle or strap like terminal lobe. It is native to the dry, sandy upland woods, pine lands and sandy loam soils from Delaware to Southern Missouri in the North and Northern Florida, Oklahoma and Eastern Texas in the South. The Southern Red Oaks leaves are alternate, simple, mostly ovate, with a rounded base, and 3-6 bristle tipped lobes, the terminal lobe generally being the longest. The upper surface is lustrous and dark green in color, the lower surface is a grayish or rusty color. In the fall the leaves turn brown to yellow in color. 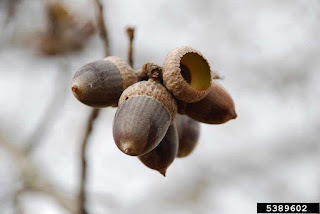 The fruit is an acorn with a shallow cup that encloses less then 1/3 of the acorn, the nut is an orange brown in color generally 1-1.5 cm long. 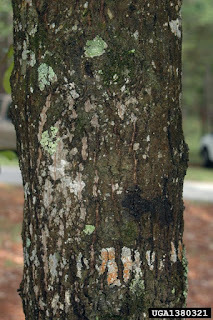 The bark is dark gray in color mixing in with black with age, it is deeply furrowed, ridged, rough and scaly with blocked plates. 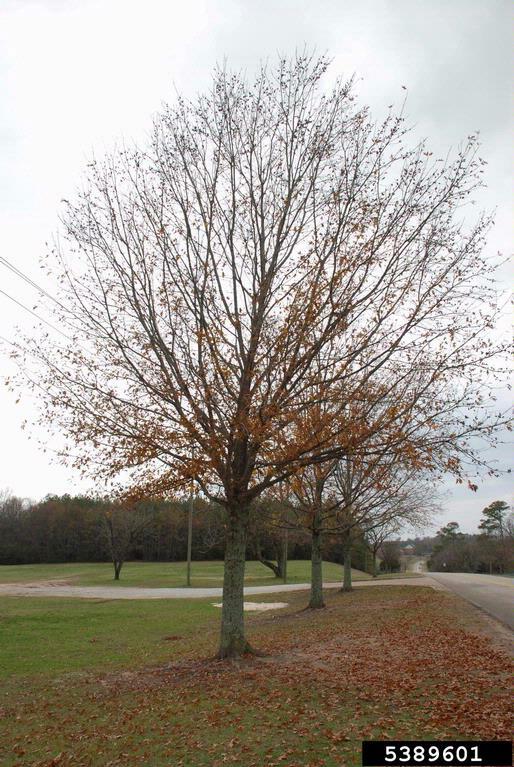 The Southern Red Oak is often confused for the Cherrybark Oak and the Turkey Oak, neither have the Southern Red Oaks signature U shaped leaf base. The leaves of the Post Oak have a similar U shaped base, but the branches and lower leaf surfaces are visably different covered with a stellate grayish pubescence. 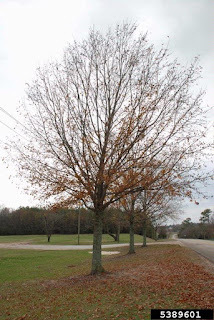 The Southern Red Oak is one of the more common Southern Red Oaks and is often found growing wild in pastures, woodlands and along roadsides in the native range. It is not very tolerant to drought or low rainfall periods, the leaves when drought stressed turn brown in large patches. It is most commonly found growing in combination with Loblolly, Longleaf and Virginia Pines, Black, Blackjack and Post Oaks, Gums, and Hickories. Arborvitae - Thuja occidentalis is monoecious evergreen tree that generally reaches heights of 40-50 feet tall, although it has the potential to grow much taller in ideal conditions. 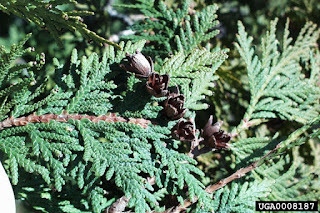 It is a native northern Cypress with scale like leaves, and flattened twigs that are grouped in fan shaped sprays with bilaterally symmetric cones. Found mostly on limestone derived soils, in swampy areas, riparian areas, and on cliff /talus from 0-900 m. It is common from Ontario and New Brunswick in the north, south through the Appalachians of North Carolina and Tennessee. 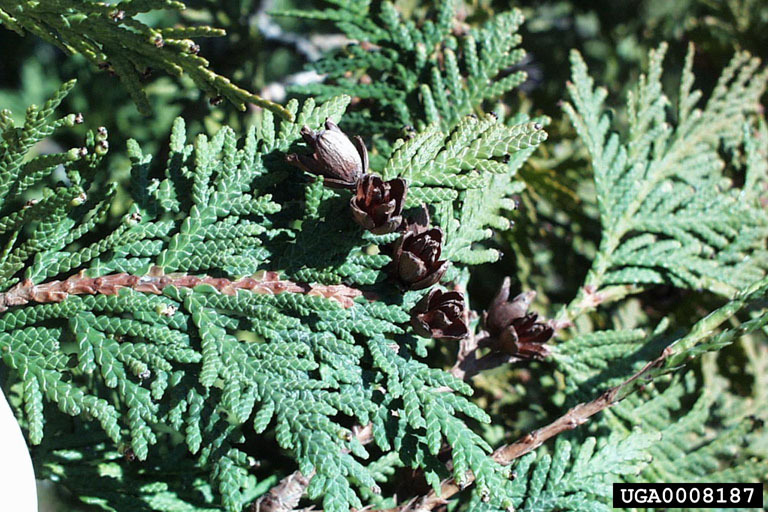 It is also commonly called Northern White Cedar, American Arborvitae, Eastern Arborvitae, or Cedar Blanc. It is written that in 1536 an extract from the foliage of the Arborvitae saved the lives of Jacques Cartier and his crew who were suffering from scurvy during their second discovery voyage to Canada, they in turn named the tree Arborvitae which is Latin for "tree of life". They brought the tree home with them to Europe, making it the first North American tree to be introduced to Europe. Since that time, there have been more then 120 cultivars discovered and named. This sheer number makes it one of the most popular trees in horticulture today. Arborvitae is also one of the longest lived trees in Eastern North America, it has been documented to live up to 1890 years. 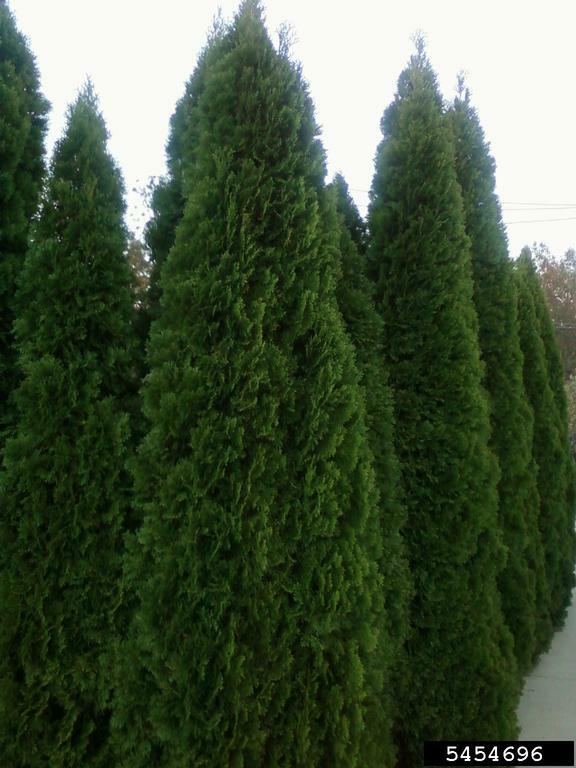 Arborvitae is a very common planting in both residential and commercial settings. It is recommended for hardiness zones 3-7 and holds it foliage year round. This tree adapts very well to both shearing and shaping and naturally grows in a pyramidal shape. It is often used as a natural fencing or planted in rows to create a hedgerow/screening effect.